Matthew Jones,76, Dies After Boat Collision On St. Lucie River | Schuler, Halvorson, Weisser, Zoeller & Overbeck P.A. One of the boaters involved in a boat collision on the St. Lucie River, 76-year-old Matthew Jones has died. The Florida Fish and Wildlife Conservation Commission said 76-year-old Matthew Jones of Jensen Beach died from injuries sustained in the two boat collision near channel marker 17 in Sandsprit Park. 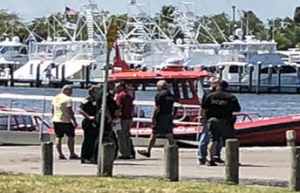 Two boats collided less than a mile from Sandsprit Park, sending two people to the hospital, according to Martin County Fire Rescue. Matthew Jones was one of the three people in a 21-foot boat going northbound on the river when it collided with a 17-foot boat going south, FWC investigators said. Patrick Smith, 76, and the operator, 74-year-old Anthony Rego, all of Jensen Beach, were also in the boat. Rego, and the operator of the southbound boat, 79-year-old Reynold Miranda, went to the hospital with injuries. Jones died at Martin Memorial Hospital.